Hi everyone! I am so happy to be a guest again on the My Favorite Things blog! 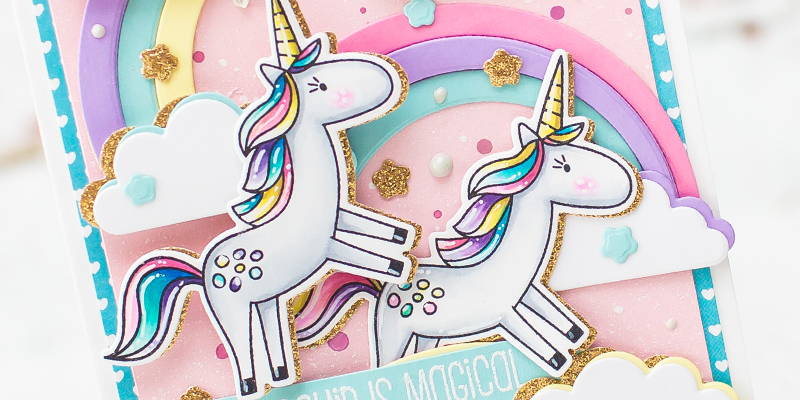 Today I will feature the amazing Rainbows & Unicorns stamp set with their coordinating dies and I also used Once upon a Rainbow Die-namics. If you missed my previous post you can check it here. The used supplies you can find bellow. I started the cardmaking with stamping, so I stamped unicorns with Rainbows & Unicorns stamp set. I colored them with my Copic Markers.The next step was the die-cutting! First I die-cut the colored unicorns, then the rainbows and the fluffy clouds. As you can see I made the same die-cuts from glitter paper too. I added more dimension to the rainbows and clouds with paper layering so now it's more interesting. The unicorns are backed with glitter paper too. When it was done I put together my background. I splattered on the soft pink cardstock with white and violet watercolor. In the end I heat embossed the sentiment to the soft teal cardstock with white embossing powder. As final touches I run the little star dies from the Rainbows & Unicorns set through my Die-cut machine with gold glitter and teal cardstock and my card was ready. My projects compressed into a photo :) If you like it pin it! Thank you!